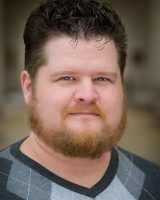 This month’s Indie Spotlight spotlights spotlight-denizen Patrick Blindauer, crossword constructor, actor, tournament host, and father, who answered a few questions fresh off the stage from playing the Cowardly Lion in a St. Louis production of The Wizard of Oz. Describe Piece of Cake Crosswords in ten words or less. What made you want to start POCC? Looking back as the year winds down, did you consider it a successful project? When I talk to people about crosswords, one of the things I hear most often is “Oh, those are too hard for me” or “I’m not smart enough to do those,” which is nonsense. Like anything, it just takes practice. It also helps if the puzzles you’re solving don’t contain ELANDs and ANOAs and OKAPI (oh, my). So I set out to make a weekly, easy-but-entertaining puzzle, and I think it was mostly successful; I did resort to using a few pieces of crosswordese throughout the year, and there was a RENO/NOLTE crossing that was tricky for some. I was surprised at how many young people subscribed, usually via a parent or grandparent. You’re about to start a Kickstarter for year 2. What will be different the second time around? Year 2 will be much like year 1, I think, though I would like to try for the 52-part meta that I joked about on Twitter. What are some of your other puzzle projects that would interest Fiend readers? There are 7 Puzzlefests for sale on my website–each one is an interconnected set of crosswords with a theme and a final answer. Themes so far have been Holidays, Summer, Music, College, Vegas, Space, and Broadway. I also write puzzles for the Crosswords With Friends app and the American Values Club Crossword, and I cohost the crossword tournament Lollapuzzoola, which takes place in NYC every August. It’s surprising to me how few of my non-crossword-related Facebook friends appear to solve the Crosswords With Friends puzzles (or perhaps they haven’t linked their accounts to the app), even though they’re very accessible. Do you think many people just don’t see solving as a social activity? Yes, crosswords are probably seen as a solitary pursuit by most, but maybe that will change over time. Personally, I feel weird sharing my solving time since it feels like either a brag or a confession. Take time to think about your image and your target audience. Make puzzles that you would like to solve. Get your stuff in the papers to build name recognition and start cultivating relationships with your editors, co-constructors, and solvers. That’s interesting — from one perspective, it might seem like publishing regularly on one’s own blog might be a way to build name recognition in order to cultivate relationships. Whereas you would advise aspiring indies to try mainstream outlets first? I think a lot of newer constructors find it tough to break in, and might turn to blogs to start generating an audience. I see your point, but if I’ve never seen a name in the byline of a major xword, I don’t jump at the chance to solve their unedited stuff–too many times it just isn’t up to par. This can be overcome with raves from people I trust in the xword community, but that’s rare. Too often it feels like blog-posted puzzles are those that couldn’t get published elsewhere. I’ve had a lifelong love of puzzles, from the time my mom bought me “Mr. Light” and my dad shared his Games magazines. I didn’t get into crosswords until years later when I started substituting solving for cigarettes. After a year, I decided to try my hand at construction, and I saw my first puzzle published in The New York Times on July 21, 2005 (a Thursday). I have since written over 60 puzzles for the Times, including a week-long puzzle contest similar to my Puzzlefests. My work has also appeared in places like the Washington Post, the Wall Street Journal, and Games magazine. I’m getting into cryptics more and more as the years go by. Maybe one day I’ll get up the gumption to try to make one. How does your other vocation, acting, intersect with puzzle constructing? Good question. They’re both forms of entertainment, but one is very public while the other is usually very private. They both take a lot of work, but if the end result is something I’m proud of, it’s all worth it. Thanks Patrick! Looking forward to the next Piece of Cake Kickstarter. This entry was posted in Daily Puzzles and tagged Indie Spotlight, Patrick Blindauer. Bookmark the permalink.